A comic genius who created a genuinely original persona which worked variations on the tattered, shifty 'professional', whether teacher ( Boys Will Be Boys (1935), Good Morning, Boys! 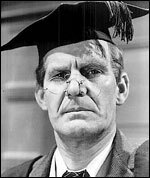 (1937), Ghost of St Michael's (1941)), barrister ( My Learned Friend (1943)), prison governor ( Convict 99 (1939)) or stationmaster ( Oh, Mr Porter! (1937), perhaps his masterpiece). In whatever circumstances, he was always required to deceive both superiors and inferiors, the latter proving sharper at detecting the radical incompetence beneath his seedy dignity. Accompanied by fat boy Graham Moffatt and toothless old codger Moore Marriott in half a dozen films for Gainsborough , directed usually by Frenchman Marcel Varnel or American William Beaudine , he created a comic oeuvre as endearing and enduring as any in British cinema. When he went to Ealing in 1941, he co-directed (with Basil Dearden ) as well as starring, and in another Ealing film, The Big Blockade (d. Charles Frend, 1942), he broke with his baffled inefficiency to play a straight role. In private life, he was apparently a very serious man with a profound interest in astronomy; he published Through My Telescope (1935). Biographies: Funny Way to Be a Hero by John Fisher (1973); Good Morning Boys by Ray Seaton (1978).